Forum Index > Historical Arms Talk > Adding Tassets? Posted: Thu 18 Feb, 2016 10:38 am Post subject: Adding Tassets? Is it possible to add tassets to this breastplate? 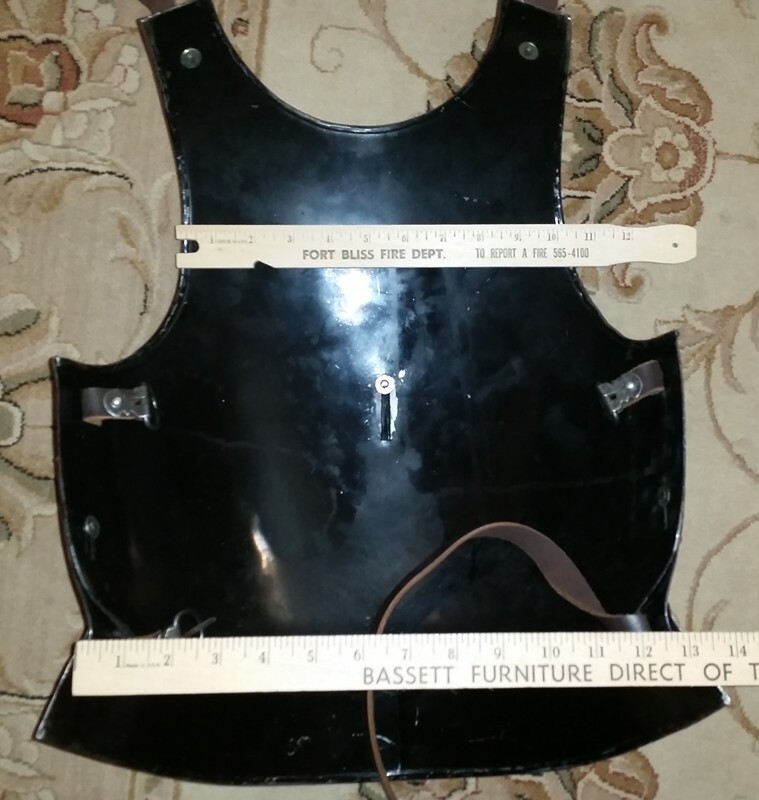 The reason I ask is because this breastplate only has one fauld (not sure if that's the right way to term it). Thanks for any info about this. Yes, but if you're set up to make tassets, it might be easier to just add another couple of lames to the fauld. It's a pretty simple thing. See repro fauld below (I don't care for the shape of the lower lame--that should either be of uniform width or fatter in the middle than on the sides). 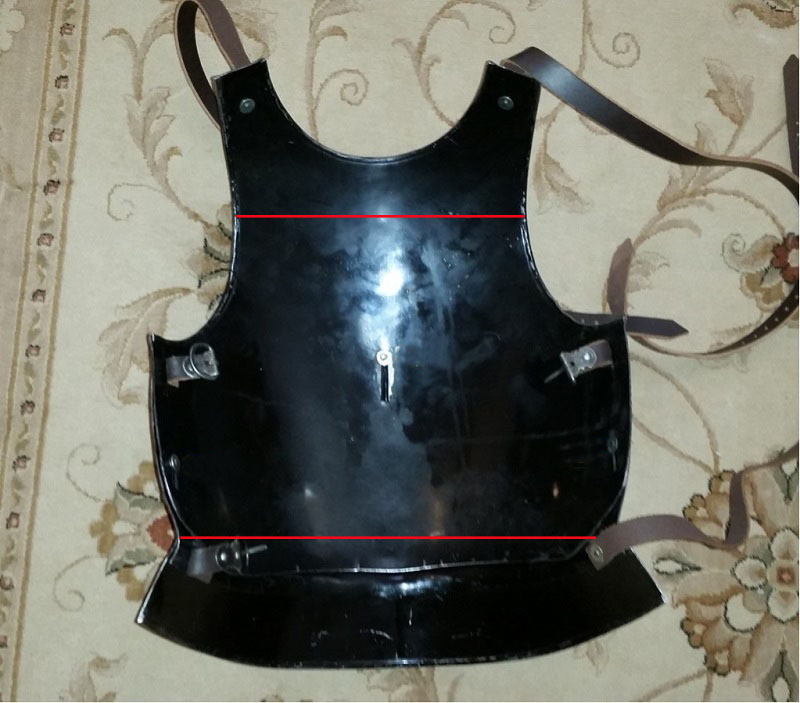 I've made two faulds for children's breastplates, and found them to be pretty easy. If the one you posted is the same as this one, I'd say it's a bargain. It looks better in the KOA photos. My main concern would be size. 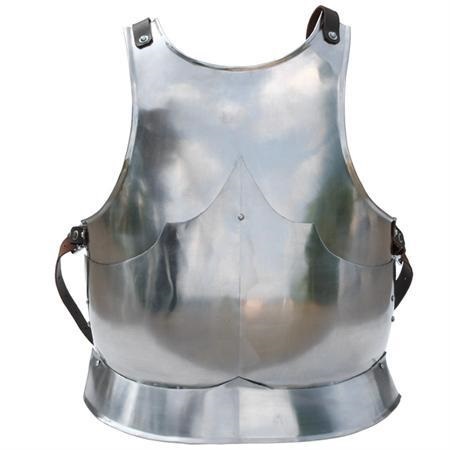 Many cheap armours of this type are HUGE and too long. The waist doesn't look too low, but if it is, this construction allows you raise the waist by relocating the plackart. Note that the central rivet is a sliding rivet. Other photos at KOA show that it has a LONG slot for sliding. What we're seeing in the standing photos is probably the low end of that slot. If the high position isn't high enough, you could just drill a hole above the top of the slot and fix the plackart in place where you want it. If it fits properly at the natural waist you wouldn't need it to slide much anyway. It would also be possible to squeeze the waist in a bit just with your hands, though that can change the fit of the fauld and plastron if you're not careful. Shoulders can be adjusted that way as well. This piece is actually pretty attractive to me as the basis of a display project. I'd take it apart, refinish, adjust the size, replace straps and buckles, maybe add lames to the fauld (though I vaguely recall that there were single-lame faulds--I'd have to check on that). It would even be possible to trim the arms and neck to fit me perfectly, then turn the new edges. Not difficult to do. That's getting into some heavy work, but the hardest part is creating the complex curve of the plastron and plackart. I'd figure I was paying somebody $100 for that, leaving the rest for me. Well, I went ahead and picked up one of those breastplates from Kult of Athena. I cut off the end of the center sliding rivet which was quite long, and re-peened it tight to the highest (shortest) position. I also peened the two side rivets tighter too. It is now about 17" from the top of the shoulders to the bottom of the fauld. Very nice fitting. As the slot is pretty long, it could accommodate much taller folks - I'm only 5'5". I got the Medium one and it fit over an arming jacket and mail haubergeon very well. It has a very nice rounded shape to it - as you can see in the image below. The only thing, and it is a minor one, is that the buckles for the straps are kind of short - almost right at the edge of the breastplate. i was looking at that again today and hoping you would check in here if you got one. i'm glad to know it works well. very tempting! Yes, it's quite a bargain, IMO. I may add additional faulds to it someday. But as is, it's still pretty nice. would you be able to supply these two important measures at some point? Based on your 17" measure, I'm guessing it's about 12" across the waist and 8.25" across the chest. Is that about right? Thanks! 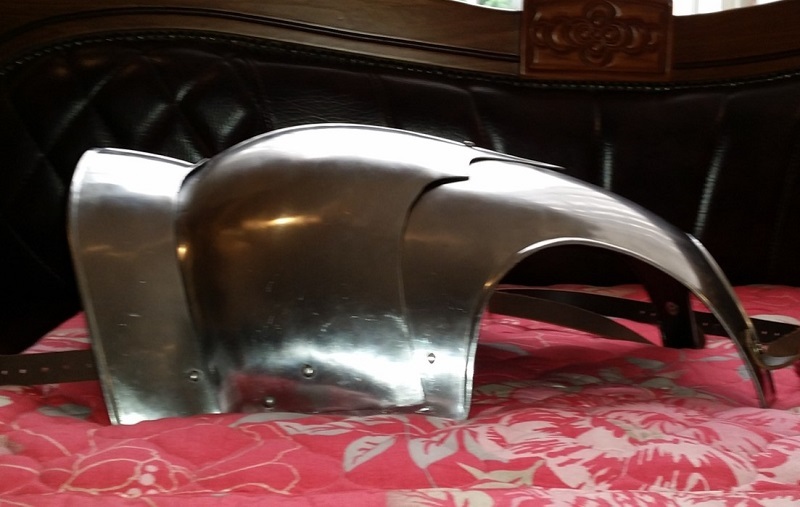 I might have to sell some stuff, but I've been missing having some armour. That's perfect, Dean! Many thanks for that data! Sounds like the medium could have been made for me. Fantastic upgrades and mods, Sean! You have some impressive skills. In addition to the faulds, I like how you reversed the cross-straps. I find mine a bit short at the buckles. i agree about the straps. i aggravated the length problem by lowering the plastron. try this--soak the straps as much as possible without removing them, and then stretch them as hard as you can and devise a way to suspend the harness from the straps while they dry. couple of nails in a ceiling beam or edge of a workbench? that should provide additional length.